2. Leave a comment on this post with your instagram handle and email address. Easy! Contest runs from now until April 21st and winner will be contacted shortly thereafter. P.S. You can still enter Melissa’s Aldo giveaway here! Ooh I love this skirt!! So much love for that skirt! I absolutely love this outfit. It’s so classy! First of all, you look lovely as usual, that skirt is a pure beauty piece! This outfit is amazing. Love the feminine skirt made edgy with leather textures in dark colours. I like the elegant pieces we’re seeing more and more of this season. The simple full skirt in white and sleeveless top, matched with a classic leather jacket is an easy and elegant spring/summer choice. Love that jacket paired with an elegant top, it’s super cool and effortless! Oh I commented twice, so sorry! Absolutely stunning outfit Jen!! Great giveaway & looking forward to more! Great spring outfit! Love the skirt detail. Beautiful as always Jen! I love the skirt and that you’re taking advantage of the gorgeous sunshine! Hi Jen! I love your style so much! 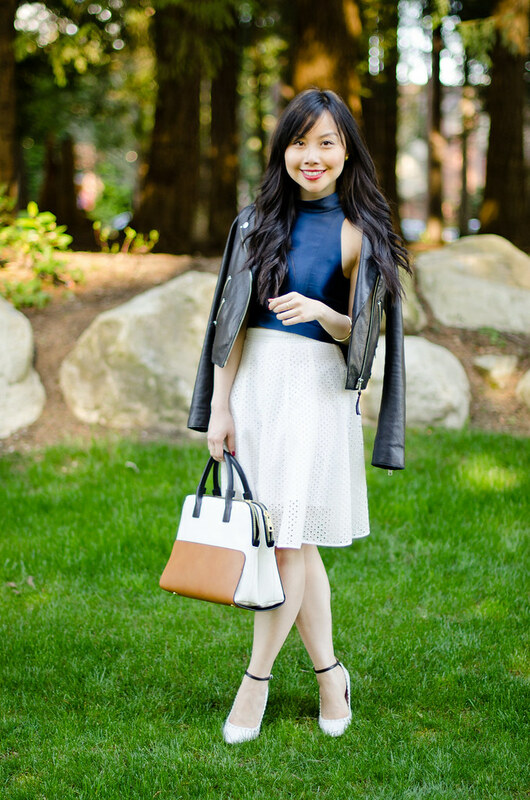 Thanks for hosting this giveaway, Club Monaco has such timeless and awesome pieces that I love! So ready for spring fashion ! A perfect outfit for Spring! Lovely outfit Jen. Love the skirt detailing! Such a cute spring outfit! I was in club Monaco Robson yeaterday and dying over the spring goods. I’ve been following your blog for a few weeks now and haven’t posted until now. I love the outfit! 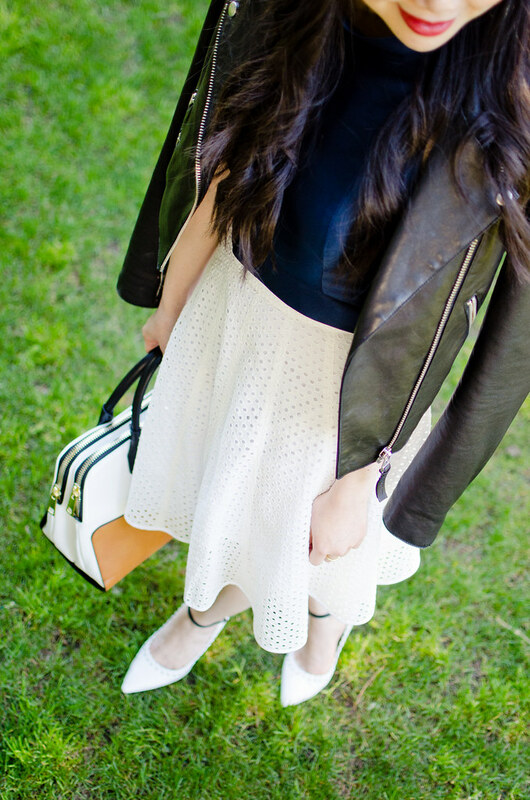 Love the juxtaposition of the leather jacket and eyelet skirt. I check your blog every other day, one of my favourite Canadian bloggers! I absolutely adore Club Monaco! It has been my favorite store for ages. I also love the look if that skirt on you! So feminine! 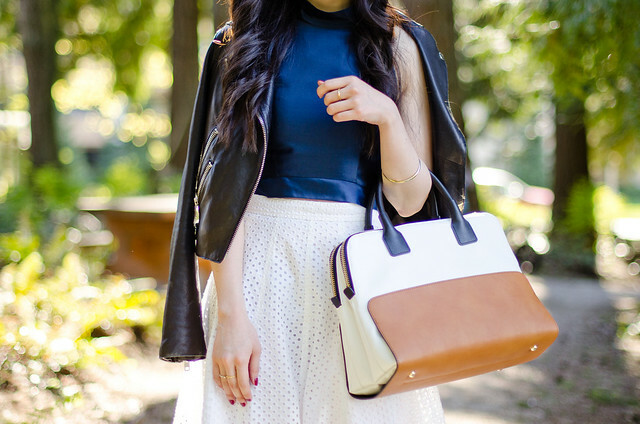 Love the eyelets and leather combo! Great outfit post! Can’t wait to shop for Spring on @Robsonstree @Clubmonaco!